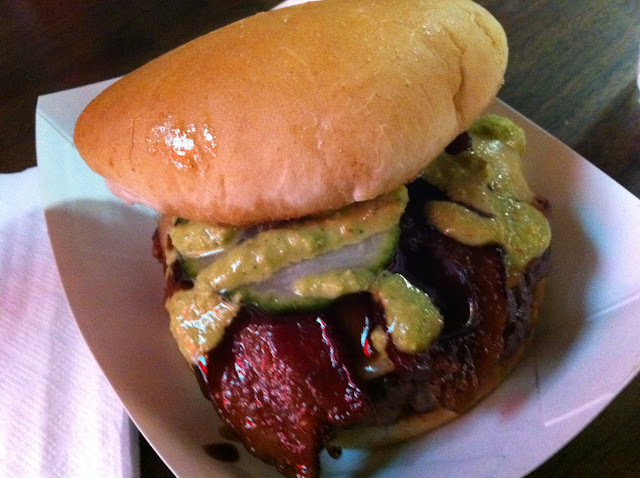 One of Vegas' favorite food trucks, Fukuburger recently opened a restaurant in Los Angeles. We haven't made the trip to Cali yet to see if their Hollywood burgers are as good as the ones off the truck, but clearly the cuisine here in Vegas isn't suffering. At all. When Chef Mags comes up with something crazy for the daily special, you'd be wise to check it out. Hopefully this masterpiece will make the permanent menu some day, as it's one of the best burgers we've ever had the privilege to devour. This was the Chinese New Year special, hence the funny name. The key to this burger is that they took the standard Fuku patty, already legendary for its bold Asian flavors and tendency to be perfectly cooked, and pepper crusted that bad boy. So the Baby Dragon already comes out with a Sichuan peppercorn crust, then adds applewood-smoked bacon, smoked gouda cheese, and an insane wasabi-hoisin-serrano chile sauce. It's just spicy enough, beautifully balanced by the sweetness from the hoisin and the creamy cheese. Fukuburger's experiments with umamification continue. Chalk up another victory.